This, my friends, was a wedding unlike any other. On a sunny day in April, two sunny people threw a kickass party, bursting at the seams with music, dancing, friends and family. And more music. Lots and lots of music. Picture this... groom enters wedding ceremony, mic in hand, gold blazer on, belting out the words to "Signed, Sealed, Delivered" as he makes his way down the aisle and a rock band, consisting of his best man and good friends, rock out on stage. Bride walks down the aisle (to more live music) and they share a quick ceremony and heartfelt vows and are married by a friend. A kiss, lots of claps and cheers, bride throws on a white leather jacket and B&R hop on stage to play "I Believe in a Thing Called Love" together. 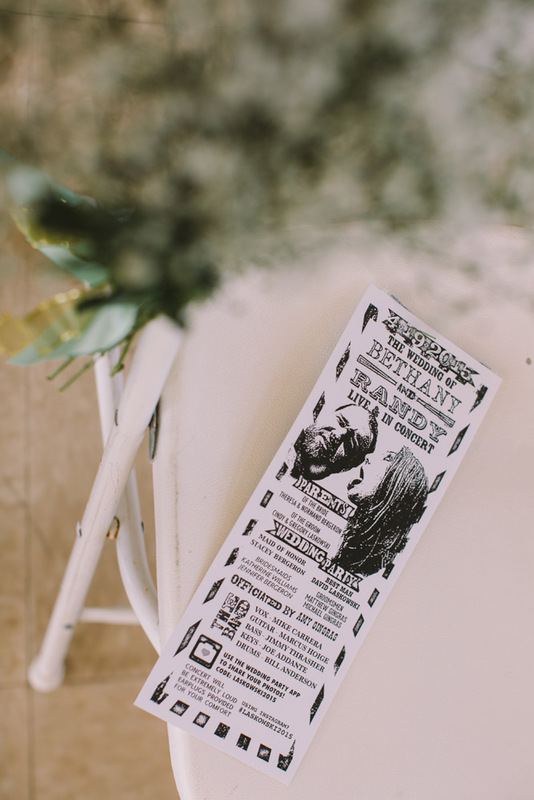 (At this point you know that this wedding is everything a wedding should be - a true celebration of love - B&R love each other and LOVE performing, and THIS was the highlight of their unconventional ceremony.) No one stayed in their seats. No one wasn't dancing. This was a rock concert - and only a little bit a wedding! And then the reception.... that wedding band, though! Groove Authority KILLED IT. I'm guilty of getting on the dance floor, too. Band: Groove Authority - THEY WERE AWESOME!